I've been a complete slack arse with these two polishes! 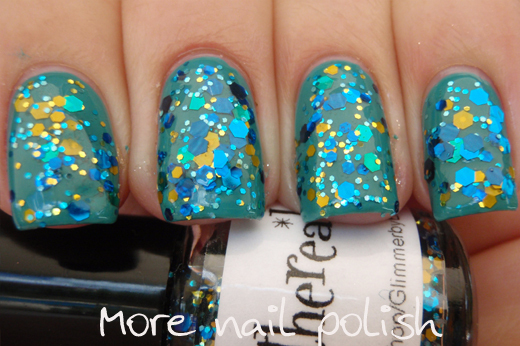 Erica from Glimmer by Erica sent me some polishes to review several months ago and I still hadn't got around to wearing these last two. I don't know why I waited so long, cause I was so pleased with how both manis ended up looking. 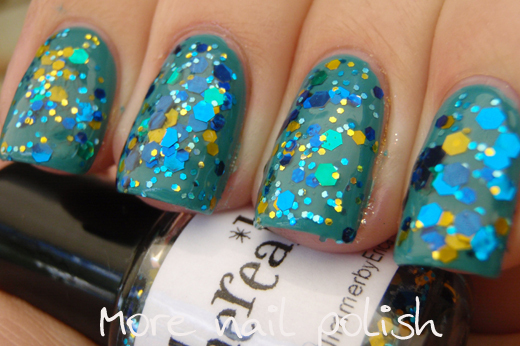 Ethereal has a combination of royal blue, green, teal and gold hexes in various sizes in a clear base. 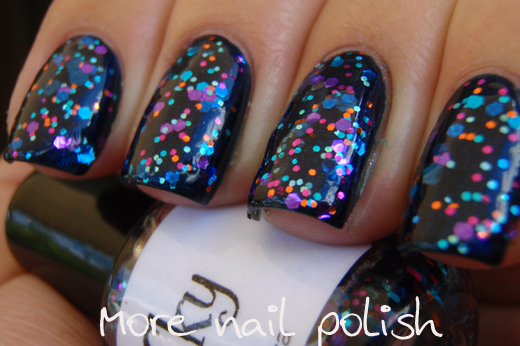 All the glitters behave perfectly and lay very smooth on the nail. 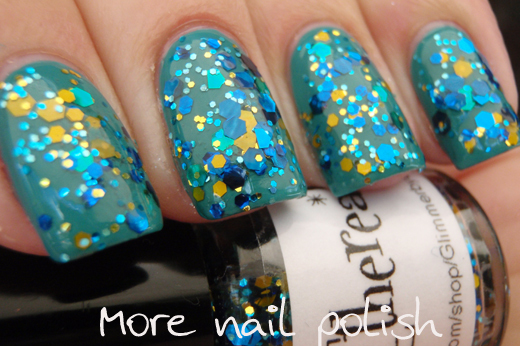 This is one coat of Ethereal over Picture Polish Marine topped with one coat of Seche Vite. I was so happy with this layering combo, the two polishes just went with each other so perfectly! Twilight Sky - I have previously tried Glimmer by Erica's Twilight Sky polish, and commented that it had some curled glitters in it. Erica sent me her new and improved version and I'm happy to report that the new version is just gorgeous. All the glitters lay perfectly flat and there was no bleeding and that's after this bottle has been sitting with me for at least three months! Here I layered just one coat of Twilight Sky over over Picture Polish Electric Blue, topped with Seche Vite. The dark metallic blue base polish was just perfect under this polish too. 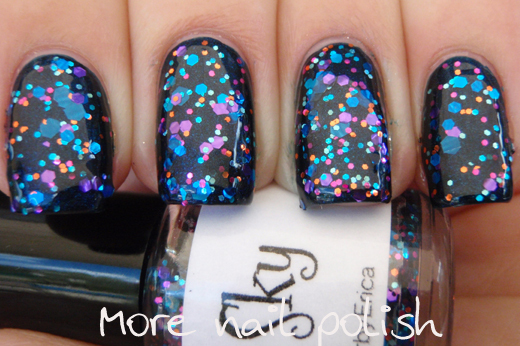 I really like that Erica has addressed the issue with the curled glitters. I've said before that I'm ok with a reflective curl (not a taco) in my glitters, as long as two coats of top coat makes them smooth. I like the way light can reflect off each bit of glitter differently. But, having said that, I do prefer flat glitters, and would certainly choose a flat glitter polish over one with reflective curling any day. I love the colour combination in Ethereal. 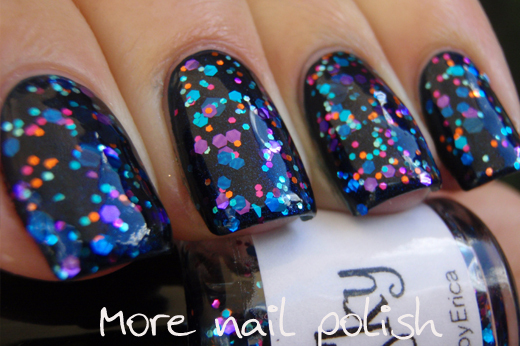 It's a stunning nail polish. They both are stunning but Ethereal is my fav'. I love both of these, but Ethereal is my favorite! I just love the combo of blue/teal and gold. So so pretty! These polishes are really good. I love them!